The headline figures said it all. With the top end continental-only Polo Coupé GT putting out 75bhp (the most powerful UK Polo was the 55bhp GL hatchback), the Sprint was the highest performing Volkswagen supermini yet built, and certainly caused a stir. That 155bhp came at 5750rpm (with 9psi of boost) with a maximum 162lb ft of torque. Top speed was 125mph, and the 0-60mph dash was dispatched in 8 seconds. Even more powerful than the in-house 112bhp Golf GTI, the Sprint was close to the production version of Renault’s 1.4-litre, 160bhp 5 Turbo first introduced in 1978. 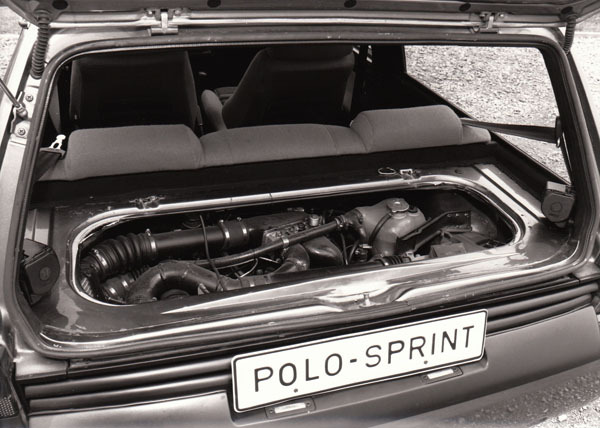 Sadly, the Sprint was never intended for production, and although rumours persisted that it may have been the basis for a 1980s Polo rally car, it was never to be. To help the Sprint handle the extra 100bhp, the rear brakes were upgraded to discs, and the 14-inch ‘Avus’ wheels were fitted with Pirelli P6 195/60 HR 14 tyres. The power was transmitted through the standard Polo trailing beam rear axle to the road via a five-speed Caravelle gearbox. Sixty-six percent of the Sprint’s 900kg (1984lb) weight was over the rear axle, but when testing the car when it attended a Society of Motor Manufacturers and Traders test day at Donington racing circuit, Richard Bremner of Motor magazine said: The Polo Sprint felt extremely stable, with excellent grip and turn in. Releasing the accelerator in mid-bend did not provoke any of the gyratory antics of earlier rear-engined cars’. 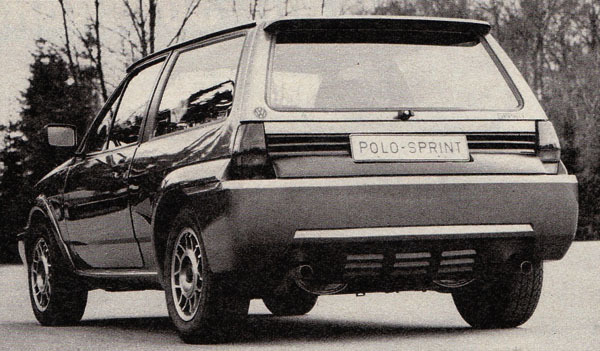 As if the idea of a rear-engined, rear-wheel drive Polo wasn’t mad enough, the rest of the car was equally wild. 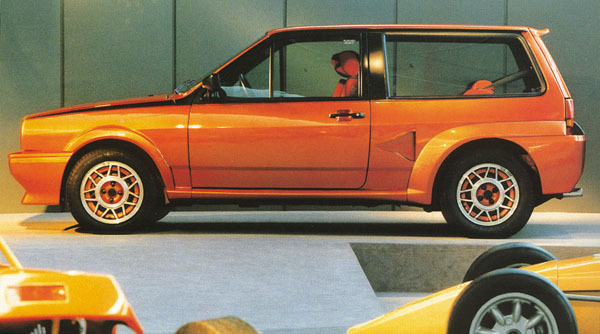 The standard Polo squareback bodyshell was bedecked in hot rod-like orange metalflake paint, while deeper bumpers with integrated spoilers were fitted, along with a larger lip wing at the top of the tailgate. Blistered wheel arch extensions helped cover the wider alloy wheels, while NASCAR-style ducts in the rear quarter panels helped feed air to the flat four powerplant. Tailgate ribbing at the rear of the car gave it a menacing look and was no doubt needed for the horizontal engine packaging. The engine itself was accessible through a carpeted hatch in the boot, similar to a Volkswagen Type 3 Variant. The rear bumper gained a cut-out to make room for the visible rear underbody extension which noticeably housed the lower half of the engine. At the front, under the bonnet lived the mini spacesaver-sized spare wheel, fluid reservoirs, fuel pump and fuel tank. The star-shaped Mk 1 Golf GTI-type fuel filler cap was located in the offside front wing. The interior was equally bespoke. A standard Polo dashboard was covered in purple velvetex and mated to a three-spoke sports steering wheel borrowed from the Polo LX special edition, while large orange and purple striped Recaro sports seats replaced the production perches. The rear bench was still in place, although a large hump for the gearbox robbed rear passengers of some room (a flat-four engine was chosen as its smaller packaging makes for a four-seater layout). A revised Polo instrument cluster neatly incorporated oil pressure, oil temperature and boost gauges in addition to the 240kph (150mph) speedo. Many observers of the time noted that the finish was so good, VW could have entered the car into a custom concours competition. Even a stereo system was fitted! What became of the Polo Sprint? Nowadays it is part of Volkswagen Classic’s ‘rolling museum’, housed in a secret warehouse in Wolfsburg along with other special exhibits which are displayed on a rotational basis at various events around the world. My first trip to the AutoMuseum Volkswagen in Wolfsburg in 1988 as a wide-eyed 14 year-old saw the Sprint there, where it happened to be on every subsequent return trip. Back in 1984, Jürgen Nitz, chief engineer of the Sprint project, stated that the car was helping his team research anti-skid and anti-wheelspin control systems which would enable front-wheel drive cars to have more power than the 130bhp he thought was the limit in 1984. How times change. 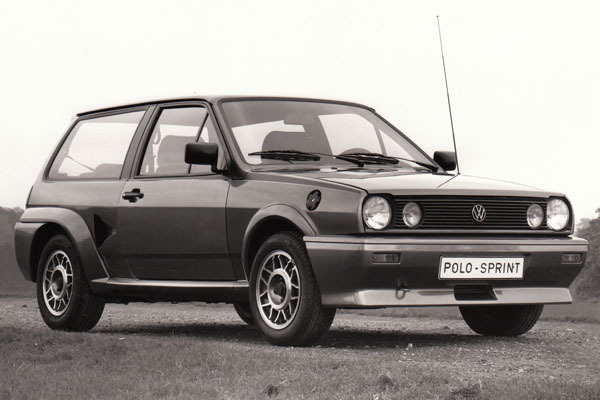 Fast forward 28 years, and next time you see your traction control or ESP warning light flashing madly in your front-wheel drive Volkswagen, just remember the role the Polo Sprint may have played in keeping you safe. Update: original Volkswagen UK press release here. Thanks to Michael Kerr.